A new tradition was initiated April 20 during Alumni Weekend at Westminster College. Members of the Golden Anniversary Class of 1968 were honored with a special Columns Ceremony on Friday morning. In the past, tradition dictated that Westminster students could only pass through the Columns to enter campus for the first official time at Freshman Convocation and then through the Columns and back into the world at Commencement. 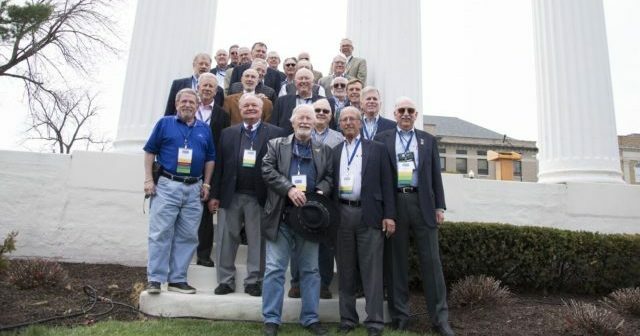 Twenty-nine members of the honored 50-year class participated in this new ritual. 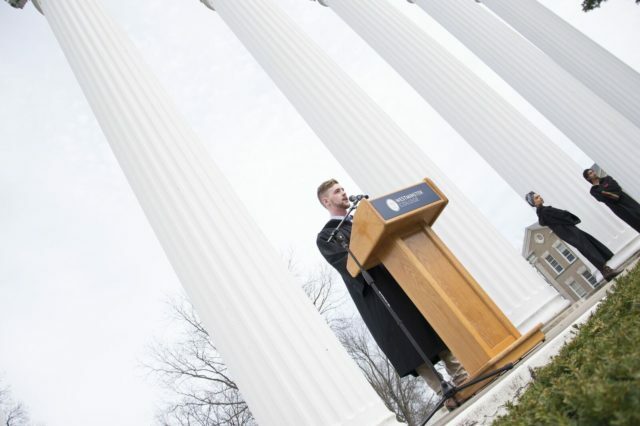 Alec Bise, ’18, a member of the mystical campus honorary society The Skulls of Seven, acted as Custodian of the Columns, welcoming the alumni to the new ceremony and administering the Athenian Oath to the group. Then while Bise read each of their names, the honored class walked individually through the Columns.